I think it's time to touch on the dates associated with certain marks. I have avoided this subject, primarily because with Corning Ware, it is not an exact science. The Hub Machine began forming Corning Ware at the Martinsburg plant in 1961, but there were other plants producing Corning Ware as well. Greencastle and Main Plant, just to name a couple. These plants did not necessarily receive new molds for new shapes at the same time, nor would they changed their stamp format at the same time.... So all dates given have a little wiggle room. The Block Stamp first appeared on the Designer Casseroles (DC-Series) in 1977, but moved to square Corning Ware in 1979/80. This mark would be revisited for the later Microwave Plus line in the early 90s and remained with the MR-Series until they were discontinued. For traditional square Corning Ware, this mark was under the Handle Lug, except for Petites, which were embossed on the bottom, but with measurement in milliliters. For French White/Classic Black and Casual Elegance, it is located on the bottom. There are myriad small modifications such as "for Range and Microwave" mark having or not having the cornflower... For a while in the mid 70s, this "cornflower stamp" was reused on Teapots and Percolators, but Hologram stamps were never used on either of these pieces. Colors of ink changed several times as well. Hope this helps to narrow down the dates of some of your pieces. Thank you so much for this information! It would have taken me a very long time to locate all this information, if indeed I was ever able to. Hi Shane! First of all, great chronology. Second, there are three stamp variations missing from your timeline. There is a version almost identical to your "1962-68" version, which first appeared on the menu-ette skillets in late '65 or early '66. In that version, the "R' with a circle appears after the word "ware", not "Corning". That version eventually turned up on all the saucepans, skillets, roasters, etc. The printing was a bit lighter too, almost silver or gray. I've always assumed those were in use from 1965 or 66-68. Also, I have a butterscotch round, which I believe was only produced in 1969-70, that has the "Cornflower" stamp (similar to the 1969-72 version). However, it just says "made in USA" with no mention of range or microwave. In addition, the cornflower stamp also appeared on the early A series pots as well. Those simply said "Good For Microwave". I believe they disappeared soon after the 1972 A Series rollout, because I've only seen three of them in all my years of collecting. Hope this info helps! This post is incredibly helpful; thank you so much for sharing! Hello Shane. What a wonderful trove of information you've gathered! I'm trying to figure out the age of a Cornflower Blue piece I recently bought at a local flea mall. It appears to be an older model, but the embossed stamp doesn't exactly match the information either here or in your A B C's article. It is not as square in shape as my 1980's set, has smaller handles, and has a lid with a small knob and wide flange that fits more loosely than the lids on my newer pieces. The embossed stamp on the bottom looks exactly like your first photo here, except the last line on mine has a C-18 where yours has a B-34. The glass lid has the mark C 20 embossed on the flange. Is it possible mine could be a pre-1960 model? Thanks again for all your research. Your blog is a pleasure to read. It sounds to me like you have a pre-1960 piece. The B-34 in the photo is only the mold number designating which hand press was used to form the piece. (These were produced before the Hub Machine went online so they were not formed by mechanized means at first) so your C-20 is probably another one of the molds that were being used. That is just so cool! This piece was dirty but with Barkeeper's Friend and a little attention it cleaned right up. I have so many memories of the familiar clink of Corningware at Christmas dinners and church socials. It always conjures up feelings of love & Grandma's house. Thanks again for all your research. Great to know & fun to read! I have a square plain white 3 liter baking dish with A-3-B 3L U.S.A under one of the handles. Is this safe to use on stovetop? Yes, as long as a piece has a Pre-World Kitchen style model number - i.e. P-10-B, A-3-B, P-1 1/2-B, N-5-B etc. It is stove top safe. Great great information! I have an A-18, 10 1/4x8 1/2x2 1/4 roaster. I think I've had it since the 70s. The rack is one with the fold out handles. I don't see that kind of rack any more. I know it was original to the pan. Any thoughts? Thanks you so much! I know exact which rack out are referring to. It is the A-21-R and it was designed to fit all 3 sizes of roasters. A-18, A-21 & A-76. Thus the folding 2 jointed handles (depending on which roaster you are using). It lays completely flat in the A-76. I just bought a mint-condition, 6 cup, range top percolator with all parts in perfect condition. It is bulbous, not streamlined, and has a blue stamp on the side that has the handle. Capital letters CORNING WARE, then a circled R slightly above the letters. Next line: (smaller letters, but still caps) CORNING, NY, USA then 184MA. One thing I very much appreciated is that the markings for how much water you are adding is on the OPPOSITE side of the handle so you can see it. I bought a new electric percolator this winter (the thrift market for percolators is drying up in my area) has the markings on the handle side which is just stupid. I originally thought mid-'60s, but any info you can give would be appreciated. It makes TERRIFIC coffee, by the way. And I got this little gem for $2.00. Congratulations Carole, you found the 6 cup Percolator (P-166) that Corning released in the early 80s. It was a replacement option for all the recalled stainless steel rimmed ones they had been selling through the 60s and 70s. (P-116, P-119, P-146, P-149) Thus, it has a Pyroceram lip, like the originals from 1959, instead of an epoxy fastened rim that leaks or falls off. Great find! It was also the last percolator that Corning made. After this one Percolator usage sort of fizzled out in favor of drip coffee makers with auto-timers. How can you tell the difference between newer World Kitchen limited edition stovetop pyroceram corningwear and late '80s-'90s pyroceram corningware? I just picked up 4 pieces(plus 2 lids). 2 I knew were older, and from blog they are from '60-'61 (actually one of each example stamp you gave.) My other 2 are obviously newer, with raised stamps under handles, one is A-2-B 2 Liter, other is A-1-B 1 Liter. Unlike the late 80s & 90s pyroceram Corning Ware, the new World Kitchen "Stovetop" line is marked "Made in France" instead of the U.S.A.
Sweet. Now I can date all of the Corning Ware I have left. I sold a lot of my Spice of Life along with their handles when I switched to Chantal cooktop and oven things. But I did keep a bit for both oven and microwave. I kept my crockpot too. I bought a lot of it in the 80s as that's when I moved out and set up my own kitchen. My Mother has a bit of the Cornflower and still uses their dishes for everyday, mix of the blue and the plain white. What if there is no stamp at all? We bought an old house and it is full of dishes. I have several pieces of the blue cornflower, but I have not been successful in locating any stamps. Does this mean it is not authentic? I have a set of the Sears & Roebuck "merry mushroom " canisters with no stamp on them whatsoever. I've seen ones dated 1976/1978 but mine has no stamp. I know they were produced by Corningware but I'm having a hard time getting much info on them. Any info you have would be appreciated. Not really sure about the canisters in particular, but most Merry Mushroom was available through Sears from 1973-1979ish. 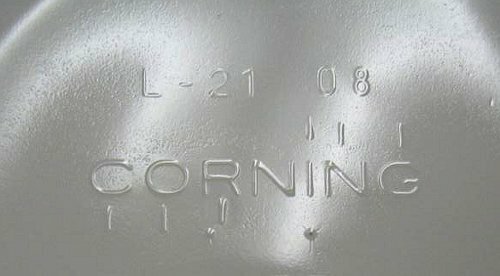 What does the number 279 MA mean after Corning NY USA? Do you have any information on Corning Ware made in Australia? I have quite a few items, so wondering if the codes mean the same wherever they were made, and that they would be pyroceram and not stoneware. Great information. I have a Cornflower Blue 6-cup teapot. Great Site, I have a question about my Spice O' Life 6 Cup Teapot. On both sides of the teapot at the lower right outside of the pattern is the # 24 with a wavy line underneath the # 24 laser etched into the teapot. What does that mean or refer to? Thank you for posting the marks/ chronology! Super helpful. I just came into some corningwear and I'm trying to figure out what is safe to use where. The items I'm most concerned about are an amazing set of Centura dishes in the "Graffia" pattern. I have some plain white that came with it that specifically say no microwave, and I've been reading that for a lot of Centura that is certainly true. But the Graffia ones do not say, and I'm having trouble dating them to figure out if they're pyroceram or not. Thank you so much, hope someone may help! The only "Centura" items that are microwave safe are the casserole/saucepans (Which are made from the Corning Ware formula) All bowls, plates, cups and mugs (no matter what pattern) are made from the actual "Centura" which is not microwave safe. This also includes most items marked "pyroceram tableware" as well. Hi Shane, I recently inherited a number of pieces of Corning Ware, Cornflower design. Both are embossed rather than printed, the first matches your first example with the stamp c-32, the second is the stylized snowflake with the mold number c-8. Both have interesting lids, instead of the "knob" handles like my mom had when I was growing up, both pieces have "fin" lids. Would this lid style denote any particular year they were made or was the lid style just a different option. The style of lids you are referring to (fin lids) were produced during the 1st and 2nd generation marks. So they are the proper lids for your 1st Gen pieces. So I have noticed a teeny gold “25” beneath the SOL pattern on a P-43-B. Is that something that is on all SOL that I have not noticed before or is it significant of something?